Premier provides products that will literally light up your life! Whether you want accent lighting or general, indoor or outdoor, lighting Premier gives you the opportunity to have it all! 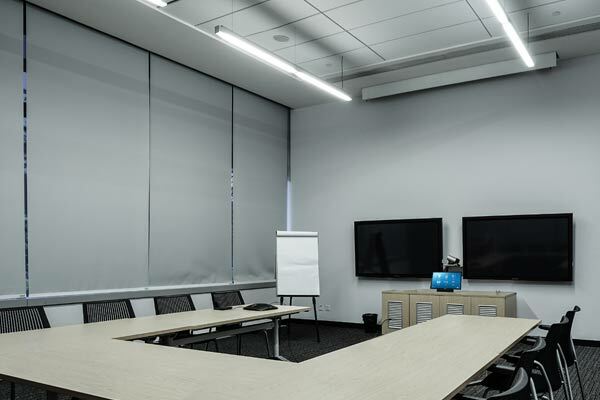 The right lighting system saves you energy, money, and stress allowing you to control your entire business from the touch of a button! At Premier we design lighting systems for you that seamlessly fit in with your environment. As experts in the field, we can promise to provide a service to you that will increase your enjoyment of your business, and your life. Ever have a nice meal ruined by the glare through the windows or tried to sit through an afternoon meeting with the sun beating down on the conference room? Either operated by the push of a button or pre-programmed to drop and raise at just the right times, automated shades make these annoyances a thing of the past. With many fabrics and designs to choose from, we can find a solution that not only enhances your environment, but saves you money on your heating and cooling bills as well.